Stir without ice and pour into a cocktail glass (building in a cocktail glass and stirring is fine too). Garnish with an orange twist. 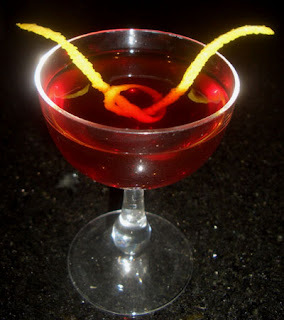 For Mixoloseum's Thursday Drink Night last week, the theme was a classic, albeit an obscure classic one -- Scaffas! What's a Scaffa? It is a mixed drink, often a liquor and a liqueur or two, stirred in the absence of ice to cool and dilute it. Historically, bitters and syrups have been considered fair game too; in fact, thinking of it as a Pousse-café that was stirred has been suggested before. It should not, however, be called a proper cocktail for it lacks the water component (a proper cocktail by the early 1800's definition means that it contains spirit, bitters, sugar, and water/ice). For a liqueur, my eyes set on Grand Marnier which is sippable on its own. To build on that, I thought of John Gertsen's Grand Marnier sensation, the Mission of Burma, and Don Lee's non-potable bitter-heavy drink, Don's Little Bitter. Combining aspects of both, I ended up with the Orange Scaffa. The Scaffa started with a dark orange aroma from the liqueur and bitters combined with the light orange note from the twist. For an undiluted cocktail, the sip with smooth and surprisingly did not singe the palate with a hot alcohol sting in the least. Flavorwise, the sip tasted like a candied orange peel, and the swallow was full of caramel notes and spices. Wonderful drink. Simply wonderful. I appreciate also your dedication.